Arak is a young dragon on his first ever solo flight, a right of passage for his kind. He’s a dreamer, the odd dragon out always thinking and imagining, forever getting his head lost in the clouds. And this time it may cost him his life. 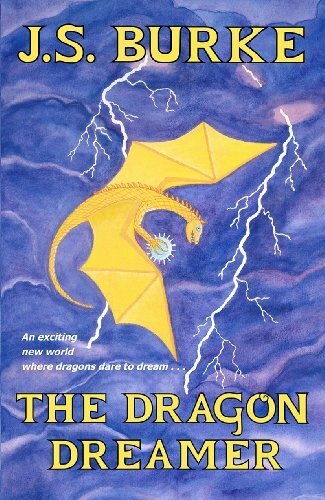 He went out too far, hoping to be the dragon to find new copper mines for his race and an ice storm has caught up with him. Injured, he falls to the sea ice below, his wings hurt, his leg broken. In the oceans below, Scree the octopus healer leaves the safety of her pod’s home on the reef to look for supplies. She’s an inquisitive and helpful octopus, with a caring heart. While collecting slug eggs near the surface, she is shocked when Arak crashes onto the ice. At first frightened by the massive dragon, her caring nature compels her to help poor Arak. And thus starts a friendship that will change the fortunes of both Arak’s dragons and Scree’s octopi. Dragon Dreamer is the fascinating tale of two cultures meeting and growing better for their union. There is no great enemy to vanquish or dark prophecy to prevent. All that faces the dragons and the octopi are survival. From underwater volcanoes to sickness, Arak and Scree work together to help both their peoples prosper. While Dragon Dreamer is clearly aimed at a younger, grade school audience, the story is both sweet and heartwarming and at times suspenseful. J.S. Burke has crafted a unique fantasy world unlike any I have ever read. Out of all the unlikely pairing in storys, a dragon and an octopus is the most out there, and yet J.S. Burke makes this story work. I would recommend this book for any child embarking into the wonderful world of books with great characters, stories, and values. You can buy Dragon Dreamer from Amazon! Thank you for writing such a nice, detailed review!